Volume holographic storage technology has the advantages of high storage density, huge data capacity, parallel read and write, fast transmission speed and so on. In big data era, this method has great potential to meet the needs of low cost and high storage density. At present, materials for volume holographic storage mainly include silver halide emulsion, dichromate gelatin, photoresist, photopolymer and so forth. Photopolymer has attracted more attention because of its several advantages, such as high diffraction efficiency, extreme sensitivity and great resolution in contrast to traditional materials. Holographic storage device fabricated by such materials with the advantages of low cost, light weight, and high commercial value are more suitable for marketing than the traditional materials, such as silver halide emulsion and dichromate gelatin. In the recent decades, photopolymer materials have received extensive attentions in the field of holographic data storage (HDS). Researchers have taken various examinations to enhance the main properties of photopolymer materials such as diffraction efficiency, refractive index modulation, and shrinkage. Varying the types of monomer and photoinitiator is considered as a common method to satisfy different applications. For example, by adding chain transfer agents into the photopolymer, researchers are able to control the polymer chain length to increase crosslinking density and diminish polymerization shrinkage. There is another effective way to improve refractive modulation index and reduce shrinkage is adding different kinds of nanoparticles to the system, such as liquid crystal, silica nanoparticles, zirconia nanoparticles, aluminum oxide nanoparticles, gold nanoparticles and so forth. Up to date, photopolymer materials have obtained near 100% in the diffraction efficiency, more than 10-2 in the refractive modulation index, and 0.4% in the shrinkage rate. In recent years, photopolymer materials not only have attained fruitful research results on HDS, but also have achieved good development in various optical devices, such as biosensing, fiber optic communication, etc. Therefore, for the long-term progress of HDS, the development of photopolymer materials with excellent performance has tremendous scientific significance and great economic benefits. Both scientific research and commercial fields need to pay more attention to photopolymer materials. Professor Zhang Xinping's group and Professor Wang Dayong's group from the Institute of Information Optoelectronics Technology, College of Applied Sciences, Beijing University of Technology, presented novel photopolymer materials doped with nanoparticles through their cooperation research work. The optical properties of photopolymer materials based on nanoparticles-doped photopolymer in applications such as holographic storage and holographic display were studied. By the design and construction of the corresponding holographic optical recording optical system, the developed photopolymerization kinetic model was used to predict the influence of the nanoparticle concentration ratio on the optical properties of the material. Through repeated experiments, the photopolymer materials were optimized to improve the optical and mechanical properties. 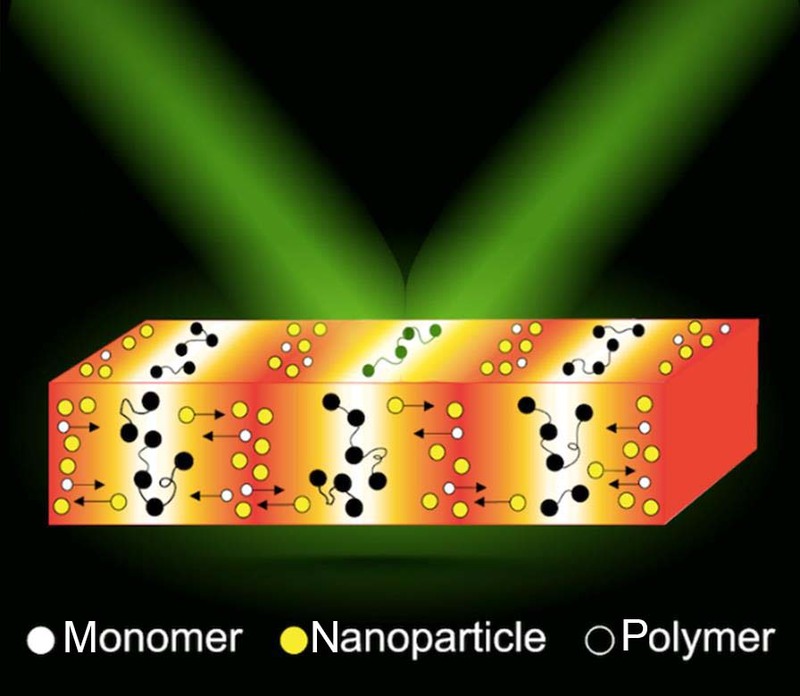 The enhancement of optic properties in consist of surface plasma technology could enhance the diffraction efficiency of holographic photopolymer materials and develop the potential of photopolymers in 3D holographic display technology. Up to now, Associate Professor Guo Jinxin, one of the group members, has successfully fabricated a carbon-nanotube-doped multi-monomer photopolymer flexible film material and a metal nanoparticle-doped photopolymer material with excellent optic properties and stability. Optical devices prepared on the above-mentioned photopolymer materials have the advantages of light weight, low cost, easy molding and processing, and large-scale industrial production. At the same time, the integration of multiple functions (such as focusing, separation, filtering and multiple recording) on a single holographic optic device could bring the effective impact on the development of HDS technology. Institute of Information Photonics Technology and College of Applied Sciences located on Beijing University of Technology was established in May 2010. It mainly engages in photonics technology and its application in basic research and technology development in the field of optical information science and technology. Institute of Information Photonics Technology and College of Applied Sciences is characterized by combining the research of information optics and ultra-fast photonic technology utilized ultra-fast laser technology, time-resolved spectroscopy and digital holography. Moreover, it has a high-level research group including 25 scientific research members. Since its establishment, it has applied nearly sixty scientific research projects such as the National Natural Science Foundation and the Beijing Natural Science Foundation. More than three-hundred journal and international conference papers have been published, including more than 200 papers in SCI journals. Jian Jialing, Cao Lin, Wei Xiqiao, et al. A review of photopolymers on holography volume data storage[J]. Opto-Electronic Engineering, 2019, 46(3): 180552.